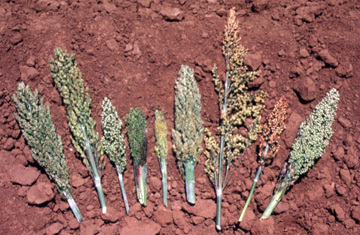 Sorghum [Sorghum bicolor (L.) Moench] is one of the world's leading cereal crops, providing food, feed, fiber, fuel, and chemical/biofuels feed-stocks across a range of environments and production systems. Its remarkable ability to produce a crop under adverse conditions, in particular with much less water than most other grain crops, makes sorghum an important 'failsafe' source of food, feed, fiber, and fuel in the global agroecosystem. Sorghum is especially important in areas such as Northeast Africa and the US Southern Plains that often receive too little rainfall for most other grains. Sorghum is a biofuel crop of growing importance, currently the #2 crop used in US ethanol production. Its lower water demands and market price than alternatives such as maize, versus their similar per-bushel ethanol yields, suggests that sorghum will be of growing importance in meeting US biofuels needs. Progress in understanding the genetic control of perenniality in sorghum makes it promising as a cellulosic biofuels crop, offering compelling advantages over seed-based production but requiring greater utilization of marginal lands and perennial crops to be sustainable. As a model for tropical grasses, sorghum is a logical complement to Oryza (rice). Sorghum is representative of tropical grasses in that it uses 'C4' photosynthesis, comprising complex biochemical and morphological specializations that improve carbon assimilation at high temperatures. By contrast, rice is more representative of temperate grasses, using 'C3' pho-tosynthesis. Its low level of gene duplication makes sorghum, like rice, an attractive model for functional genomics. Sorghum is an excellent bridge from Oryza to leading tropical grass crops with much larger genomes and more gene duplication such as sugarcane, another of the world's most efficient biomass-producing crops that is presently the leading biofuel source worldwide. The Sorghum bicolor genome and the diversification of grasses. Nature. 2009 Jan 29;457(7229):551-6.